With its new SORTEX K sorting unit, the Buhler Sortex business unit in London has set new standards in the production of safe and clean foods. Continuing innovation and improvement are central to any market leader’s drive to consolidate or even strengthen its market position. The Buhler SORTEX business unit is once again demonstrating its leadership with the rollout of its two new SORTEX K optical sorters, which have been designed specifically for the fresh and frozen vegetable market sectors. The technology, which has proved its worth in the SORTEX Z+ dry sorting units, is now being applied in revolutionary solutions in the facilities of fresh and frozen vegetable processors. SORTEX K sorting unit is available from Autopac Systems. The SORTEX K is available in two versions, a Powerslide belt version for fresh produce and a chute version for frozen products. The new unit builds on the success of the Niagara model, of which more than 200 are installed worldwide. Both versions use Sortex-approved in-feed vibrators, which ensure a constant and even flow of product. 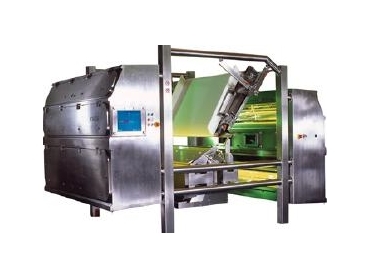 A semi-vertical chute feeds the optical system for frozen products while a Powerslide belt fitted with an automatic belt tracking system is used for fresh produce. Importantly, the Powerslide and the chute configuration allow the cameras and the background lamps to be positioned at the front and rear rather than above and below the product flow. This eliminates the need for additional cleaning to keep the sorter running. Prior to the official launch in October 2006, the first SORTEX K trial sorters went into service in Spain. The fresh-produce sorter with the Powerslide belt feeder handles bean and root vegetables for Iberfresco SA in Olmedo near Valladolid. The new frozen-product sorter is undergoing thorough testing at Ultracongelades de Cortes in Zaragoza. The SORTEX K is somewhat wider than its Niagara predecessor, enabling it to deliver ten to fifteen percent higher throughput. In the new SORTEX K, four newly designed, high-definition cameras register the colours. With their enhanced colour separation capability, they allow easy removal of product with even a small and subtle colour defects. In applications involving frozen products, two InGaAs cameras are used in addition to the four high-definition cameras. The InGaAs technology uses the invisible spectrum to take removal of foreign material to a new level. David McCambridge, Sortex Senior Applications Engineer, says: “I have never before seen such efficient removal of all types of foreign material and such small colour defects. Anything selected as unacceptable by the cameras is removed by 256 pneumatic ejectors. They have been designed specifically for the SORTEX K and are more powerful than previous designs, improving rejection of defects. They are linked to an ejector system that fires the ejectors at the profile of an individual reject rather than a broad area. As a result, the amount of good product lost in error along with the rejects is reduced significantly. The PRO-file shape recognition system removes defects that do not conform to the normal product shape. The PRO-file shape recognition system allows the SORTEX K to operate at higher speeds due to its ability to recognise touching objects. A new, easy-touse and rapid user interface is another important feature of the new sorter. Up to 50 product modes can be saved, and no extras are required for different products. Future units will be available with the K Anyware software. It will enable Sortex engineers to link up anywhere in the world through the internet. This will allow many problems to be prevented in the first place and swift corrective action to be taken to the few that do occur. The new SORTEX K sorter is the result of substantial investment in research and development by Sortex’s in-house team. It is further proof of Sortex’s commitment to the development of its own technologies rather than purchasing systems off the shelf. Bruno Kilshaw, Sortex Managing Director, sees the SORTEX K launch as evidence of the company’s commitment to continuing R&D and product improvement and its responsiveness to processors’ needs.